Lesson Plans -From Invalid to Domestic Scientist in Ten Short Years: Women and Domestic Work in the 19th and Early 20th Centuries. NAME OF LESSON: From Invalid to Domestic Scientist in Ten Short Years: Women and Domestic Work in the 19th and Early 20th Centuries. This lesson plan examines the domestic lives of middle and upper class American women from the mid-19th to early 20th Centuries. It will examine the social and economic conditions that led to a culture of invalidism and the changes that gave rise to the culture of domestic engineering. This source is a broadside, meant to give advice to housekeepers on how to keep a frugal and well-managed household. It demonstrates the expectations of women within the home before the age of the “invalid” woman. “Dr. 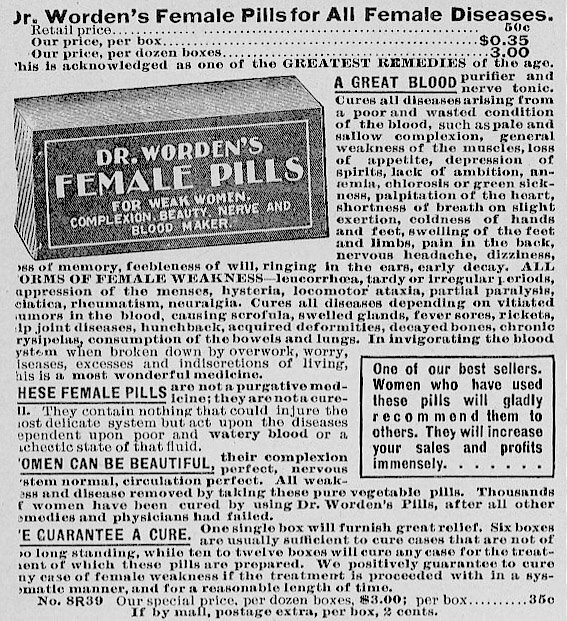 Worden’s Female Pills.” Sears and Roebucks catalogue, 1902. http://photos1.blogger.com/blogger/2650/1885/1600/femalepills.jpg [visited 5/11/2006]. Richards, Ellen, “Housekeeping in the Twentieth Century.” American Kitchen Magazine, 12 March 1900, 203-207. This source provides an excellent characterization of the attitude that led to a revival of “housework” and its transformation into a “domestic science” in the early twentieth century. “When Fatigued Drink Van Houten’s Cocoa”. Copyright 1900 by Lyman D. Morse Advertising Agency. Published in: Culinary Topics. Dec. 1900. Ropes Mansion Collection, Peabody Essex Museum. This source demonstrates several important aspects of the culture of invalidism. It shows the role of advertisers in perpetuating this situation among upper and middle class women. It also shows the significance of the complicit role played by maids in this culture. Finally, it shows the relationship between the maid and the “invalid” mistress.